Removing bamboo is a very challenging task that if not done right can be very expensive. And all too often when it's time to remove it, people end up calling a landscaper or tree removal service. Sounds like a good idea right? Well, unfortunately most of these contractors don't have the knowledge or resources to handle this very important task. It spreads. 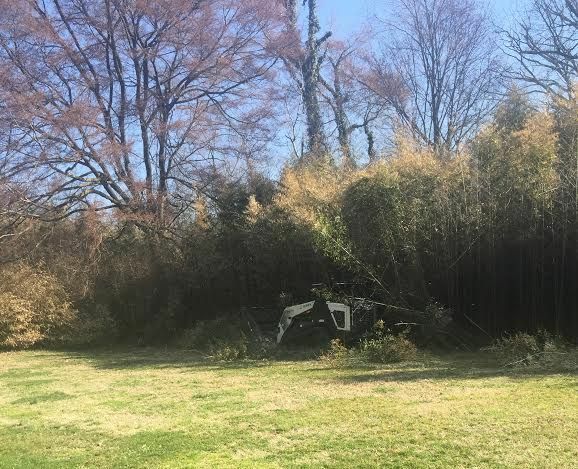 If bamboo is removed from your property but there is still a small portion of the plant growing next door, it will spread back to your property over time. It requires multiple applications of poison done right to kill it. It grows back. This is especially true if bamboo is close by. The best method to grind the bamboo and then remove the stumps and as many roots as possible. Any shoots that reappear should be chemically treated to prevent growth. Grinding bamboo is very tedious. The chips and grindings are very stringy and fibrous. Most landscapers or tree removal contractors just aren't equipped to remove bamboo right. And you don't want to trust just anyone to remove your bamboo. Let the professionals at Montpelier Grading LLC get it done right the first time so you're not stuck with another bill when it comes back. John was very friendly, timely and professional. I appreciated his counsel throughout the project. After working with less reliable contractors, it was a relief to work with someone who did exactly what was agreed upon in the allotted time. We'll definitely work with him again.